Home > Bow Ties > Paisley Bow Ties > Bow Tie "Blue Paisley"
Freestyle, pre-tied and clip-on bow ties available in three different widths. Pure silk. Navy blue, beige, green, red, and burgundy. 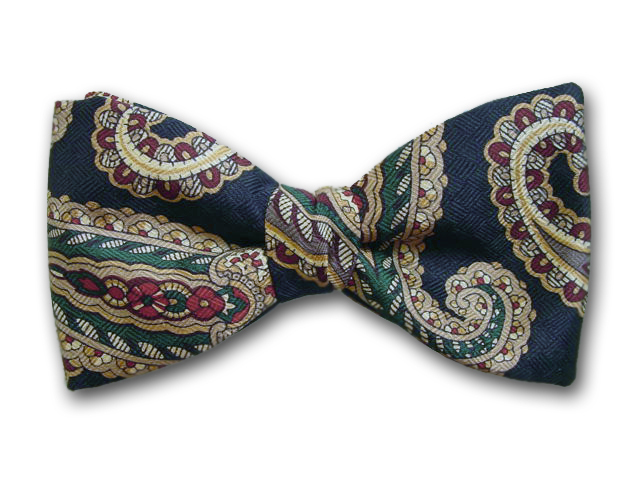 Freestyle (self-tie) bow ties: Adjustable from 14" to 18" or from 18 1/2" to 22" (custom). Pre-tied bow ties: Permanently knotted bow with an adjustable neckband that fits neck sizes from 14" to 22". Clip-on bow ties: Permanently knotted bow that clips to your shirt collar with a metal clasp. No neckband. You do not have to provide neck size for clip-on style. Width: Our standard bow width is 2 1/2" for all styles. We also offer two other widths (Large 3 1/2" and Slim 1 1/2").